The beauty of working with a solderless breadboard to test your electronic circuit designs is that if the circuit doesn’t work the way you expect it to, you can make changes to the circuit simply by pulling components or jumper wires out and inserting new ones in their place. All breadboards consists of several hundred little holes called contact holes that are spaced 0.1″ apart. This is a convenient spacing because it also happens to be the standard spacing for the pins that come out of the bottom or sides of most integrated circuits. Thus, you can insert all the pins of even a large integrated circuit directly into a solderless breadboard. Beneath the plastic surface of the solderless breadboard, the contact holes are connected to one another inside the breadboard. These connections are made according to a specific pattern that’s designed to make it easy to construct even complicated circuits. The holes in the middle portion of a solderless breadboard are connected in groups of five that are called terminal strips. These terminal strips are arranged in two groups, with a long open slot between the two groups, like a little ditch. It is in these holes that you will connect components such as resistors, capacitors, diodes, and integrated circuits. It’s important to note that the rows of holes are not connected across the ditch. Thus, each row comprises two electrically separate terminal strips: one that connects the holes labeled A through E, the other connecting the holes labeled F through J. The breadboard is designed so that integrated circuits can be placed over the top of the ditch, with the pins on either side of the integrated circuit pushed into the holes on either side of the ditch. The holes on the outside edges of the breadboard are called bus strips. There are two bus strips on either side of the breadboard. For most circuits, you will use the bus strips on one side of the breadboard for the voltage source and use the bus strips on the other side of the board for the ground circuit. Most breadboards use numbers and letters to designate the individual connection holes in the terminal strips. 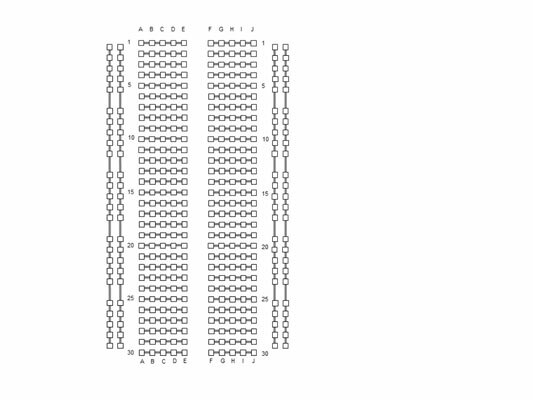 The rows are labeled with numbers from 1 through 30, and the columns are identified with the letters A through J. Thus, the connection hole in the top-left corner of the terminal strip area is A1, and the hole in the bottom-right corner is J30. The holes in the bus strips are not typically numbered. Solderless breadboards come in several different sizes. Small breadboards usually have about 30 rows of terminal strips and about 400 holes altogether. 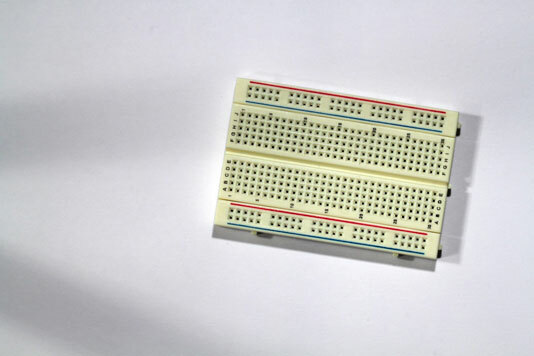 But you can get larger breadboards, with 60 or more rows with 800 or more holes.